In the graphic designers’ toolbox, grids are considered to be one of the fundamental staples. But why is this? Why are a few grid lines thrown over your canvas so important to the design project? Every designer will have their own reason for why grids are important to them, but in short, they help you to structure your design in a way that would otherwise be difficult, time consuming and troublesome. So, if you’re on the fence about delving into the world of grid based designs, let’s discuss 15 recasons why simply adding the use of a grid to your repertoire could significantly improve your designs. One of the chief uses for a grid is to keep your elements aligned and ordered, and your page design clean and neat. This is because grids encourage alignment, that’s a big part of their job description actually. By establishing a grid system, you are creating a set structure for yourself to align elements against, and in doing this, you can create for yourself a neat, clean, and organized layout. For example check this grid-based layout by Christine Wisnieski at Twist Creative and how neatly it aligns each element to form a clean end result. When using a grid, find one that you can imagine yourself aligning each of your elements against. Be that your type, imagery, graphics, or any other elements. Start with a rough idea of what you’re looking to achieve and build your grid to suit. In a world where we’re always looking to get things done quicker and better, the words “improved efficiency” is music to many people’s ears, so this point should sound like a symphony. Grids can greatly speed up and improve your design time, as they can act as a guide that signals where is best to place, position, and scale elements. Instead of randomly positioning elements until you find a decent looking composition, a grid should help guide you toward a natural solution. Think of your grid like the foundation to a house, it’s one of the first things you lay down, and from there you use it to build up onto it. If nothing else, grids and type are two design elements that very happily go hand in hand. A strong grid can help make type-heavy layouts appear neater, more organized, and can help to enhance the legibility and readability of body copy. One way grids help enhance the legibility of your type is through something called the ‘baseline grid’. These are narrow horizontal rows that run across your design that each line of your type sits on, a bit like the ruled lines in a notebook. What these grid lines help you to do is align your bodies of type so that they each sit on the same level. While many people may not specifically notice if you don’t align each line of your type, they will subconsciously notice that your design appears more cluttered and a little messier than a layout that does align its type. In short, it’s a small change with big results. Here’s an example of a baseline grid in action. Note how each line is perfectly aligned to one another, creating a clean and neat typographical effect. Do you ever have to work with other designers? If so, grids might be the answer to relieving some of the stress and frustration of miscommunication. As previously mentioned, grids help in many ways to give an underlying structure to your design and provide a guide as to where certain elements should be placed. Therefore, if you have a solid grid set up in your design and a new designer jumps in, they will (hopefully) be able to see how you’ve set it up and how you intend to position elements. For example, think about if you were working on a design like the one below and you needed another designer to jump in on the document and place a third paragraph of type. Thanks to the grid system in place, there’s less chance that they will not place and align it correctly. Plus, there will be less back and forth messages about things like “How wide should the column be? How far over from the previous column of type should I place it?” because all the answers are already answered by the grid. When working with other designers, set up a grid system that is self explanatory and that suits your end product. Don’t use 13 columns if all you need is 3, and don’t set up a grid system and then avoid aligning your elements to it. Keep your grid functional and keep it useful. The beauty of grids is that they are consistent and even things, so when you divide your design up into a certain amount of columns, you will begin with a symmetrical layout. From here, it should be much easier to judge which side of your design is overpowering the other. Check out the website design below by Maan Ali and how it avoids unbalanced layouts by using a sharply symmetrical grid and evenly sized blocks of information and imagery. Similarly, this design by Braulio Amado uses a three column grid with a centralized graphic to keep the design symmetrical and perfectly balanced. Even though the design is fairly strong and could easily be considered overwhelming, the neatly aligned and perfectly balanced grid keeps it cool, not cluttered. Grids are the saving grace for multi-page layouts. By establishing a strong grid for your layout, that very grid will be transferrable from page to page and layout and layout, making it much easier for you to maintain cohesiveness throughout your layouts. Think about a website such as Rolling Stone and how it has many different pages that each have different structures and compositions of content on them. How do you make each page work the best possible way while still maintaining a cohesive and consistent layout throughout each? Check out the image below that compares Rolling Stone’s music page to their front page. By using a four column grid structure to the website design, each page looks cohesive, clean, and familiar, but there is space for Rolling Stone to let each page function as it needs to function. 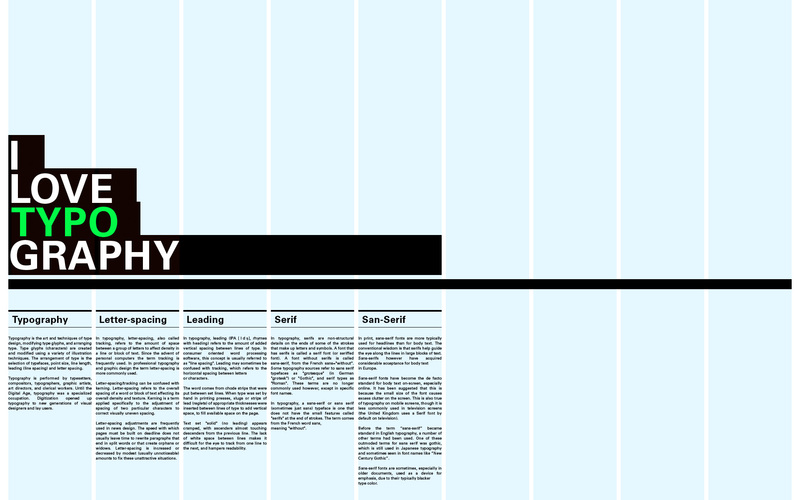 A common use for grids in multi-page layouts are for manuals such as style guides. Since these are manuals used for educational purposes, they should be kept linearly designed, and so that means employing a grid system! Check out this style guide from Bosphorus by Mike Collinge below and note it’s consistent use of grid. If you’re tackling a project that requires you to design multiple pages, don’t forget to go through this Designer’s Checklist For Designing Awesome Multi-Page Layouts. We all know how important hierarchy is to a design (if you don’t, be sure to swing by this list of reasons why every design should have at least three levels of hierarchy) and a grid can help speed that hierarchical process along for you, and make it easier too. First, let’s look at web design. The following image is from NASA’s homepage. NASA use a strong four column grid in their website design, and they manage to communicate hierarchy by stretching the more important images across more than one column or row. Note how the lead story ‘Halloween Skies to Include Dead Comet Flyby’ spans over two columns and two rows making it the most attention-grabbing part of the site design. Other important stories such are also stretched over multiple columns, attracting attention towards those too. Print works very similarly. By using a grid for the basis of your design, you can draw attention toward or away from certain elements by scaling them up to extend across multiple columns. This example below by David Tang does just that, attracting attention to some points like number 23 and 30 by using scale and grid alignment. Grids are a fantastic tool for ridding your design of the dreaded cluttered effect, particularly when that’s not the effect you were going for. They do this by employing the use of margins. Margins are, by very basic definitions, the space around your design. Generally speaking, the tighter your margins, the tenser and more cluttered your design can look, but the more open your margins, the neater and cleaner your design looks. Check out the diagram below, margins are marked by the dark grey color. So, by using a grid, you will often also use margins, which will help keep your design looking much more open and clean. Another way using grids helps avoid clutter is by encouraging the use of gutters. Gutters are the spaces in between your grid’s columns. These are adjustable but should each remain consistently sized so as to keep your grid functional. Let’s look at a design that employs both of these grid functions to achieve an effective result. This wallpaper via Aisle One highlights its use of gutters and margins to draw attention to just how effectively each have been used. One of the chief reasons a lot of designers (and artists, photographers, etc.) use grids as a basis for their work is because it is thought to help guide you towards a mathematically more pleasing design. Let me explain. There are a few ways that grids are thought to make your designs more pleasing, and one of the most commonly (and most easily) used is ‘the rule of thirds’. You might have heard of this rule in relation to photography, but the basics of this theory is that by dividing your design up into a series of even horizontal and vertical lines, wherever those lines intersect (marked below by circles) is considered to be a focal point, and a pleasing point to place elements of your design. As previously mentioned, this theory is used a lot in photography too, to the point where many photographers will deliberately frame photos so that focal points sit on these points. Give the rule of thirds a go in your next design and see if you find your designs to be any more pleasing to the eye. All you have to do is divide your page up into three even sections horizontally and vertically, and then use these handy guides to build up your design. Sticking to your newly formed grid will ensure you have a clean, organized, and beautifully aligned design on your hand, but occasionally and deliberately breaking that grid will give that clean design a unique, eye-catching effect. Check out this spread design for 99U that uses a simple, neat three column grid, but breaks that clean linearity by running striking yellow type diagonally over the entire spread and off the page. This disregard for the established grid creates a memorable, effective design that really hones that message of “Think Differently”. By breaking the grid you can draw focus toward certain elements too. Check out this website design for Big Cartel that keeps things neatly aligned to the grid with a few exceptions. By having some parts of the design jutting out from the grid and breaking the strong vertical lines the design has going on, the eye is attracted to those elements. Worried that a grid won’t suit your design? Fear not, as all grids are highly functional and flexible things and can adapt to your changing designs. When creating a grid, you have the choice of as many columns as you like which is what makes grids flexible. Have a look at the diagram bewloe that demonstrates just how different a one column grid can be compared to a two or three column grid. Of course, grids can commonly go all the way up to 13 columns, depending on the needs of the designer and design. For example, the spread below uses one full page image and very simple type, making the one column grid system it uses perfect. Whereas this layout design by The Design Surgery uses thirteen columns on each page as the articles are generally a little longer and there are images that need to be slotted in at various points. Keep in mind when designing, the number of columns is totally up to you, but the more, the more flexible your design will be, and the fewer, the simpler and less flexible it will be. If you’re looking to approach your design from a different angle (in a literal sense), grids have you covered there too. Grids can work just as effectively on a diagonal axis as they can on a horizontal or vertical one. Check out this poster design by Andrew Ackroyd that captures plenty of attention by placing type and graphics along a diagonal grid, creating an appropriately modern and stylish effect. Diagonal grids can also work wonders for image-heavy layouts. Check out this design by Karen Hoffstetter and how it uses diagonally-constructed frames to tessellate images. It’s worth a note that this design evidently uses both a horizontal/vertical grid as well as a diagonal grid to keep things beautifully aligned and neatly organized. While grids are most commonly exemplified in magazine and editorial layouts, these are not the only mediums to which grids can be applied. In fact, they can be used throughout just about any medium of design. A lot of famous logos were built on grid systems, such as the Braun logotype pictured below. As you can see, by using a grid to construct the logo, each letter was kept consistent, clean, and strongly built, resulting in an iconic logo being born. Grids can also be used throughout illustration. Check out this stunning literary metropolis illustration by Dean Gorissen and note how clean and sharp each angle is, which is what heavily suggests that this illustration was created using some semblance of a diagonal grid. So, whatever your medium, a grid can be immeasurably handy. While they may not work for every style and every designer, they can definitely work for many, so consider giving a grid a go with your next project. Are you looking to delve into the world of white-space-heavy designs? Grids can help you out with that, too. When you’ve divided your design up into your desired amount of columns, place your necessary elements, but keep some rows and columns empty, leave them to simply be filled by white space. Check out this layout by João Oliveira that uses a lot of white space by simply not filling areas of the grid. This results in both a stylish, open, and sophisticated design as well as a functionally minimal layout that gets right to the point with little to no clutter or unnecessary elements. A similar function is at work in this poster design by Mehmet Gozetlik. By aligning the type and imagery to the center column only and leaving the outer columns empty, the designer creates a beautifully balanced, centralized and visually effective poster design. As if they didn’t do enough already, grids can also help your type by encouraging more easy to read typographic layouts. You see, the eye is very picky about line lengths for bodies of type. If lines are too long, they become harder to get through, and if they’re too short they seem too choppy and broken for us to immerse ourselves into. Generally speaking, the golden line length for type is a minimum of six words per line and a rough average of about 50-65 characters (including spaces) on each line. By using grids on type heavy layouts, creating even columns of type becomes a whole lot easier and quicker to do. And, through columns, you have a much stronger hold on your line lengths. This is one reason why newspapers rely so heavily on grid-based layouts, it helps them to construct columns of type much faster and easier, making their content far more digestible and readable. Interested in learning more about all things editorial? Be sure to swing by and have a look at this list of the 50 best editorial designs from around the world. Whether you’re a fan of grids or not, there’s no doubting how useful they really can be to so many designs, it’s no surprise that the use of them can be dated back to the 13th century. Grids have so many uses, from helping to align and balance your designs, to helping you achieve cool effects like diagonal typography. They’re really so much more than just some lines on a page, they structure, guide, and shape your design in a way that helps you to achieve your desired end result.